In the petroleum business, techniques and equipment are always changing. For nearly 95 years, Foster Fuels has worked hard to stay up-to-date on the latest training for all of our employees, equipping them with the knowledge and skill to best serve our local community. In our latest training, employees Darrell St. John and Evan Hodnett participated in learning liquid control meter configurations. This process is commonly out sourced to a third party by other companies, however Foster Fuels differentiates from other petroleum dealers by learning this technique and practicing it in house. 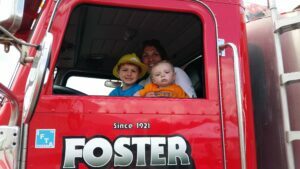 As a family business, Foster Fuels remains committed to providing integrity and excellence in everything we do. That’s why we choose to provide education and training for our staff members so we know how to personally help you in any situation. Our expertise and our commitment to our customers have allowed us to expand the range of services we offer to include emergency generator fuel delivery, repairs and maintenance to critical equipment, and more. For any questions you may have, give us a call at 800-344-6457. Can a Propane Tank Freeze? fosterfuels has written 76 posts. Very informative about gas fireplaces and log inserts. Very helpful.